I've whipped up this dish a few times lately. It's quick and delicious, and it works with dried pasta or a batch of homemade fresh, as pictured. 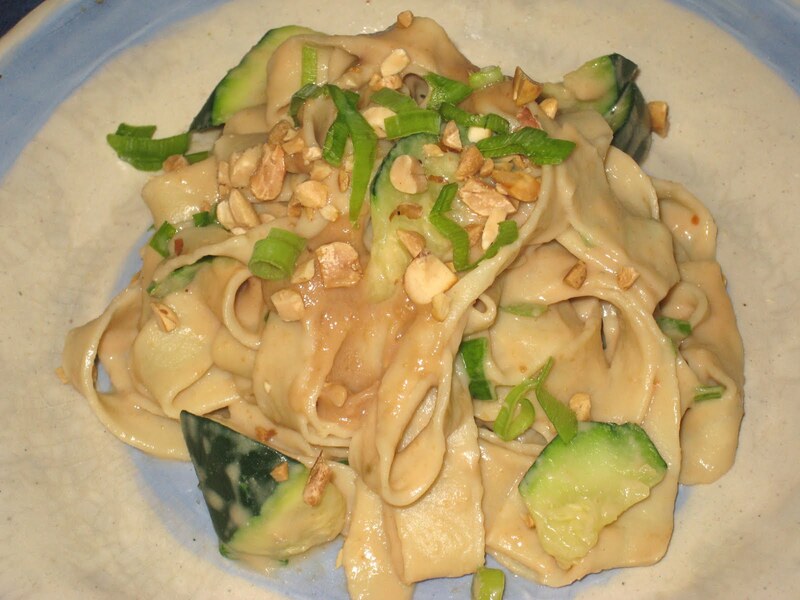 The peanut sauce is thick enough to stick to the pasta, so every bite is the perfect blend of sweet, salty, sour and spicy flavor. I don't have much more to say about it than that, other than this: you should definitely add it to your regular rotation. It's perfect for those times when you have nothing around and not much time but want something with a little more flair than the usual five-minute dish. Any vegetable would work, and you don't even really need that if your pantry so bare that you have no fresh vegetables whatsoever. The other ingredients are staples that you can make sure you always have on hand. While the water is heating, combine the first 9 (through garlic) in a medium saucepan and bring to a boil over medium-high heat. Lower heat slightly and continue to cook, stirring frequently, until the sauce thickens, about 5 minutes. When the large pot of water is boiling, add 1 tablespoon of salt. Add the zucchini to the pot, cover it immediately and turn off the heat. Cook the zucchini for 3 minutes, until it has just softened. Remove from the pot without draining the water and put it into a large mixing/serving bowl. Turn the heat back on under the pot of water and bring it back to a boil. Add the pasta and cook it a few minutes if fresh or according to the package directions if dried. Reserve a cup of the pasta water and drain the rest. Add the hot pasta to the bowl with the zucchini, then add the peanut sauce. Stir gently but make sure to combine it well. Add the scallions, reserving about 2 tablespoons for garnish. Serve immediately, garnished with the scallions and roasted peanuts.